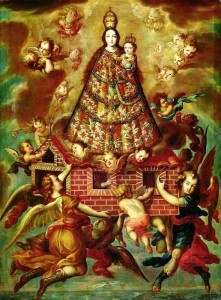 Angelic Translation of the Holy House of Our Lady of Nazareth to Loreto. Anonymous painting, 17th century, Mexico. How did the Holy House take off from its foundations and reappear intact about 2,000 miles away, where it remains to this day? At a conference organized by the “Amici del Timone” Cultural Center in Staggia Senese, Italy, titled “The Story of the Incredible Move of the House of Mary of Nazareth to Loreto,” a topic was developed which challenges engineering. 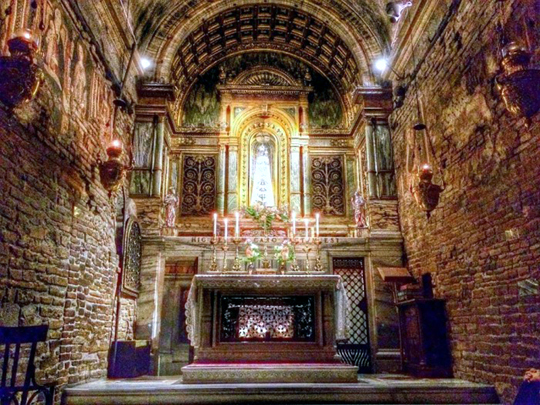 Indeed, the Holy House, birthplace of Our Lady and where the Archangel Gabriel announced to her the Incarnation, has been for many centuries in the town of Loreto (Santa Casa di Loreto), in the Marche region of Italy, facing the Adriatic Sea. However, the Annunciation took place in Nazareth, in the Holy Land, where the foundations of the Holy House remain to this day. When compared with the dimensions and characteristics of the Loreto House, they match perfectly; but the similarities and concordances do not end there. How did the Holy House take off, so to speak, from its foundations and reappear about 2,000 miles away, where it remains intact to this day? According to historical evidence, the move took place in the thirteenth century; but how could it have been done given the poor technological resources of the time? The move is attributed to an angelic action officially recognized by Popes and sustained by saints. 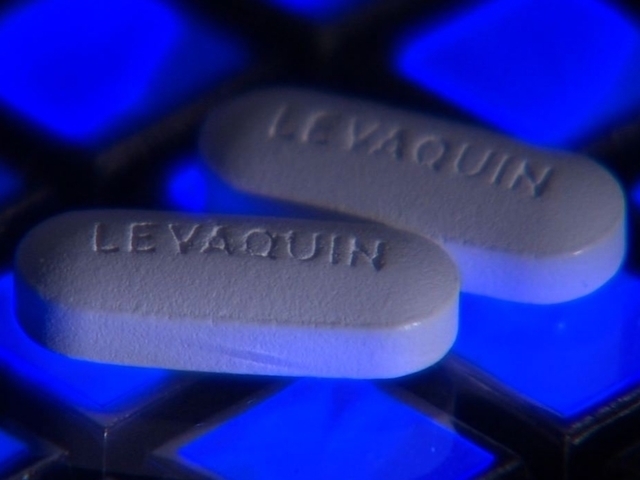 However, such authoritative approvals are not intended to explain the material procedure, which carried an object the size of a house from one continent to another practically overnight. This transfer, however, was confirmed by historical, documentary and archaeological evidence. Once again, for the astonishment of many, science confirms the Church. Prof. Giorgio Nicolini, who devoted his life of study and research to the case, spoke at this conference. Based on these scientific evidences, he proved indisputably the veracity of the miraculous transfer. During his lecture, Professor Nicolini demonstrated the existence of many documents and eyewitness accounts of the transfer, which science and human method cannot explain. He also established a chronology of the change of location. 1. On May 9, 1291, the Holy House was still in Nazareth. 2. On the night of May 9 to 10, 1291, it traveled nearly 2,000 miles and reached Tersatto (now Trsat), in the region of Dalmatia, in what is now a suburb of Rijeka, Croatia. On that occasion, Nicolò Frangipane, feudal lord of Tersatto personally sent a delegation to Nazareth to ascertain whether the Holy House had indeed disappeared from its original place. The emissaries not only verified its disappearance but found the foundation on which the house was built and from which the walls had been taken away as a block. Around these foundations in Nazareth, the Basilica of the Annunciation was built. In Loreto, the Holy House stands firmly, without its foundation, directly on the ground. 3. On the night of December 9 to 10, 1294, the Holy House disappeared from Tersatto and landed “in various places” of Italy. For nine months it stayed on a hillside overlooking the port of Ancona, which thus came to be called “Posatora,” from the Latin “posat et ora” (to set down, or land, and pray). A church was built on the site as a memorial, as was recorded at the time and signed by a priest “Don Matteo,” probably an eyewitness. Two tombstones also commemorate this occurrence. One is from the same time period of the event and is written in old Vulgar Latin. The other, from the sixteenth century, is written in vernacular and is a copy of the older. Posatora’s oldest tombstone already mentioned “Our Lady of Loreto,” making it clear that the inscription was done after the House’s departure from the site. 4. In 1295, after nine months in Posatora, the Holy House moved to a forest that belonged to a woman called Loreta, near the town of Recanati. That is where the name Loreto comes from. 5. Between 1295 and 1296, after spending eight months in this location the Holy House was miraculously transported to a farm on Mount Prodo belonging to two brothers of the Antici family. 6. In 1296, after four months at this farm, the Holy House departed and landed on a public road on Mount Prodo connecting Recanati to Ancona, where it remains to this day. Countless other elements attest to the historical truth of this inexplicable translation of the Holy House. Three churches were built in Ancona—two still existing—testaments that eyewitnesses saw the “flying” Santa Casa arrive in Ancona and stop in Posatora. Moreover, in Forio, on Ischia Island, fishermen who traded with Ancona returned narrating the events that had taken place in 1295. 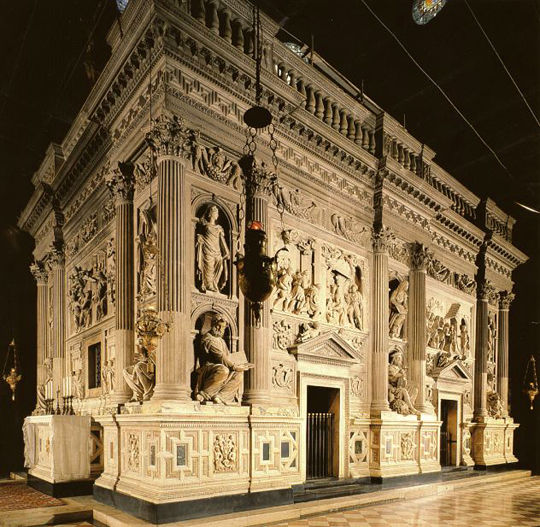 Their reports led the city inhabitants to erect a basilica dedicated to “Santa Maria di Loreto.” They also saw the Holy House in Ancona with their own eyes. Various bishops of the region approved the veneration of the miraculous translations. For centuries the Popes renewed the approvals until Urban VIII, in 1624, definitively established December 10 as the Feast of the Translation of the Holy House of Mary, Mother of God. Several Popes, including Paul II, Julius II, Leo X, Pius IX, Leo XIII and Pius XI documented their recognition of the translation. These respective documents, beyond their religious aspect in which the Popes recognize the event as supernatural, are recognized as valuable documents by historical science. Professor Nicolini strongly reprimanded the materialistic mentality, at times agnostic, atheistic or Protestant, which seeks to discredit the authenticity of the Holy House venerated in Loreto. In a way, this opposition encouraged deeper studies, which ended up proving the Holy House actually came from the Holy Land. Proofs include the chemical composition of the material used to build the house, its shape, and many architectural details. Some, denying the angelic translation, went so far as to fabricate a story that a fanciful princely family from Epirus named “Angeli” had dismantled the house and transported it brick by brick at the request of the Crusaders facing the destructive advance of Muslims. That “family” then rebuilt the house in Loreto. Such an operation, with the transportation conditions of the thirteenth century, would have been a more miraculous feat than the angelic translation. The stones and bricks are kept together with a mortar whose physical and chemical composition is found only in Palestine and precisely in the region of Nazareth. They are nonexistent in the Marche region or anywhere else in Italy. Moreover, if the house was dismantled and rebuilt in place after place along its journey—as claimed by its fanciful objectors—one cannot understand how it could possibly have maintained the exact geometric proportions of the Nazareth house, whose foundations, to this day, match perfectly the walls of Loreto. Nor would it have been possible that nobody saw or heard the house being dismantled and later rebuilt, especially in the brief span of one night in the center of the shrine in Nazareth and then again in Croatia and Italy. Even more inexplicable is the fact that the Holy House finally came to rest across an old dirt highway. On this road, the passage of animals and carriages naturally opened ruts in the center of the roadway, raising the roadsides, and forming ditches on both sides. Thus, the way the house landed, its three walls, with no foundation, are supported partly on ground and partly over open air. Today pilgrims can see this for themselves through a glass floor. Glass on the floor for the Holy House allows pilgrims to observe the walls without foundations, still supported on the ground and partly in the air. The Recanati City Hall, moreover, had already at that time forbidden the building of houses on public roads and had ordered demolished all buildings found to be in violation of the ordinance. How, then, could someone have rebuilt a house cutting across the road without anyone noticing? Another great hurdle comes from the lack of means in those days to carry an entire house, even if dismantled brick by brick and stone by stone. It would weigh a few tons. Transport by road would have likely been unfeasible due the delay and the amount of chariots, animals and men it would require. Transportation by sea, while more feasible, would also have been too time-consuming and prone to loss due to storms. More complicated still would be to cut the walls in segments and take them intact on a 2,000 mile journey and then glue them back together without leaving traces of the joints. These material factors, Prof. Giorgio Nicolini explained, postulate the impossibility of such transportation with the technical means of the time. From Professor Nicolini’s long and detailed demonstration it is clearly much more reasonable to believe the angelic translation resulting from a wondrous work of God, for Whom nothing is impossible, and Who has worked far greater miracles. For human hands to have performed such a translation is to consider an event even more miraculous than that done by the work of angels. PreviousUSA 2017-2020: An Ungovernable Nation? Meet Marine Le Pen America Could Sure Use A Few Politicians Like This! LOVE HER!